Boilers account for around 70% of the carbon dioxide (CO2) emissions in a gas heated home. By replacing your old boiler with a new energy efficient condensing boiler and upgrading your heating controls, you will significantly cut your home's carbon dioxide emissions and save hundreds of euro annually. There are two types of condensing boiler, regular and combination. 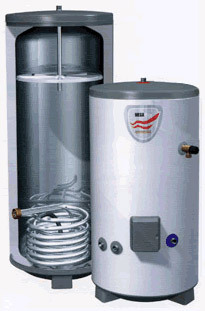 A condensing boiler heats your hot water within the hot water cylinder where the water is stored. Combination condensing boilers give you instant hot water without the need for a cylinder by heating it directly from the mains. An energy efficient condensing boiler works by recovering as much as possible of the heat which is normally wasted from the flue of a conventional (non-condensing) boiler. Energy efficient condensing boilers convert 85% or more of their fuel into heat, compared to 65% for older boilers.